Relief & Care for Hypertrophic & Keloid Scars · Hy-Tape International, Inc. Skin injuries can heal in the number of ways. Under the best of circumstances, the skin fully closes and heals, leaving a barely noticeable line in the skin. Some scars may appear as skin discoloration, or they may leave depressions in the skin. For the most part, these types of scars can be treated topical treatments, laser therapy, or dermal fillers. On the other hand, some scars are raised, where the skin borders appear “heaped up” compared to the surrounding skin. These hypertrophic and keloid scars, as they are called, can be itchy, chronically dry, and painful. Because they are raised, hypertrophic and keloid scars are often plainly visible to others. As such, they cause embarrassment and emotional suffering for those who bear them. Making matters worse, hypertrophic and keloid scars are among the most difficult type of scar to treat. No single treatment for keloid and hypertrophic scars is perfect. Most patients attempt more than one (and often several) treatments before they find one that is acceptable. 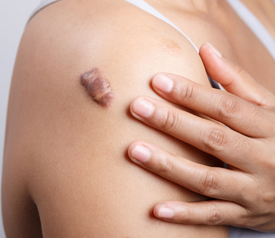 Typical medical treatments for hypertrophic and keloid scars include injections, pressure therapy, cryotherapy, laser therapy, and surgical excision.1 Patients often start with corticosteroid injections—physicians inject the scar tissue several times over a 4 to 6 week period. If these painful injections do not work, physicians move on to fluorouracil injections (or similar drug) intended to destroy proteins and cells. If injections fail, patients may move on to cryotherapy (freezing), laser therapy (burning), and surgical (cutting) excision. In these approaches, the goal is the same, namely, to completely remove the scar tissue. The deeply unfortunate problem is that hypertrophic and keloid tissue removed in these ways often tends to grow back. So patients often must face another procedure to fight back the regrowth, or simply adapt to living with the hypertrophic scar. Since cutting or destroying hypertrophic skin lesions generally causes them to return, researchers have long sought a way to treat the scars non-invasively. One of the more interesting approaches to treating hypertrophic and keloid scars is the use of zinc-oxide tape. We have known that zinc tape can reduce the appearance of the scars since at least the 1980s. Drs. Söderberg, Hallmans, and Bartholdson treated 41 patients with keloids are hypertrophic scars by simply covering them with zinc tape.2 After six months of treatment, hypertrophic scar tissue was noticeably reduced in all 41 patients. Moreover, scar redness decreased in every case. Most impressively, scars in 23 of those patients had been reduced to the level of the surrounding skin, which is one marker of complete healing.2 Pain and itchiness decreased in most patients as well, and in half, disappeared totally. It is unclear exactly why zinc oxide tape should be so effective in treating hypertrophic and keloid scars. One leading explanation is that zinc oxide tape combines three therapeutic interventions in one. First, the occlusive tape protects scars from UV light, which is widely known to cause scar darkening and discoloration.4 Second, keloids and hypertrophic scars respond favorably to pressure. Presumably chronic pressure on the scar (i.e. pressure therapy) decreases the flow of blood and oxygen to the hypertrophic tissue, starves it, and keeps it from growing uncontrollably.5 The occlusive nature of certain tapes may also create a keratolytic effect, which helps break down excess skin.6 Lastly, zinc embedded tape provides a constant topical source of zinc to help soothe, soften, and shrink the scar.2 Zinc is critical for the action of the enzyme, collagenase, which breaks down excess collagen and skin.7 These three effects apparently combine to deliver the remarkable clinical effects seen by Dr. Moshref and Dr. Söderberg’s group. Of all of the commercially available medical tapes, Hy-Tape is perhaps the best choice to use in the treatment of hypertrophic and keloid scars. Hy-Tape is occlusive, which means it can completely cover the scar keeping out air, fluids, and harmful contaminants. Moreover, the occlusive nature of Hy-Tape may promote a keratolytic environment. At the same time, Hy-Tape also blocks harmful UV radiation from reaching the scar tissue, which can help the skin heal and minimize the risk of skin discoloration. Perhaps more importantly, Hy-Tape also contains a powerful zinc oxide-based adhesive similar to that used in clinical studies.2,3 Not only is this zinc oxide-based adhesive soothing to the skin, but may also help reduce the appearance and symptoms of hypertrophic and keloid scars. Beyond these core benefits, Hy-Tape is simply great medical tape for scars. Hy-Tape is highly moldable— as the tape heats up to body temperature, adhesion to skin increases, and it conforms to the natural curves and recesses of the body. This is especially important when treating irregularly-shaped, hypertrophic scars. Hy-Tape also comes in a variety of forms including single use rolls and individual strips. Thus, you can use exactly the right amount of tape for the job, which is cost-efficient. While no treatment for hypertrophic and keloid scars is perfect, invasive therapies like injections or surgery often provide poor, impermanent results. Zinc oxide-based occlusive tape, on the other hand, is completely noninvasive, and has been shown in small clinical studies to be helpful. Hy-Tape provides all of the key attributes one looks for in zinc oxide-based tape therapy while being easy-to-use and economical. Indeed, Hy-Tape is an intriguing, noninvasive, first-line or adjunctive therapy for hypertrophic and keloid scars.